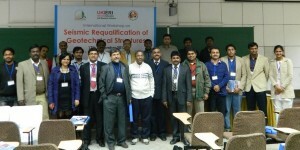 Indian Geotechnical Society (IGS) in association with IIT Guwahati and IIT Delhi, organized “International Workshop on Seismic Requalification of Geotechnical Structures” on 17th December 2012 at IIT Delhi, New Delhi, India. The workshop was organized as a part of an ongoing UKIERI (UK-India Education & Research Initiative) project between IIT Guwahati (India) and Universities of Bristol and Surrey (UK) as the leading partner institutions. Other collaborators of the project & workshop are NIDM (National Institute of Disaster Management) and IIT Bombay, India. In total about 70 members participated in the workshop. The inaugural address was delivered by Prof. K. S. Rao, Immediate Past President, IGS, New Delhi. The UKIERI project aims to develop a methodology to re-examine the safety of the existing pile foundations and retaining walls in the light of recent research findings (hopefully better and refined) and of course taking on board the lessons learned from recent earthquake experiences. The workshop delivered talks on diverse topics related to the project theme, covering: ingredients for seismic requalification procedure, latest understandings of piles and retaining walls behavior under seismic conditions, approaches for strengthening and retrofitting, and construction practices. There were 14 invited presentations in the workshop. The details of presentation titles and speakers are given in Table 1. Proceedings of the workshop were released in a book form titled “Seismic Requalification of Geotechnical Structures (Draft Version)”. Long discussions were held among the participants discussing the challenges in seismic requalification procedures. It was felt that selection of proper ground motion parameters and procedure for ground response are vital in analyzing the seismic capacity of the geotechnical structures. Keeping in view of the discussions raised, the draft version of the book shall be revised and reviewed so that selected papers can be published in a Special Issue of Indian Geotechnical Journal in due course.